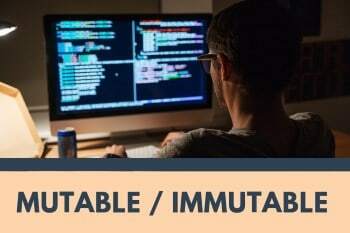 Mutability and Immutability are core principles in various programming paradigms. Mutable types have individual identities and are compared by reference, that is, variables hold references to objects, or rather they point to the memory location of an object. Immutable types don’t have individual identities hence are compared by value, i.e. the value in the variable and not the location they are referencing. Here is a code snippet to show what we mean by objects being mutable. var anotherCar = car; //here we assign the value of car to anotherCar. console.log(anotherCar.color); //this shows blue because it is referencing the memory location of the car object. What it means for mutable types is that, when we change the value of a variable, changes apply across all references to that variable. When you modify a string, a whole new string is created, and the name of the variable assigned to its memory reference. There’s no way of changing the internal state of an immutable type, so the variable simply gets reassigned to a new reference. Same goes for numbers. Let’s define and assign values to some variables at the beginning of our script, then create some functions to see if we can manipulate the values in our variables. Let’s walk through the code step by step. console.log(someNumber) // the value will still be 50. The same scenario goes for someString variable and the changeString(someString) function. This means we can run this function repeatedly and still get the same result, since the initial values in the string or number do not get altered. What of objects and arrays? Read on to find out. When we run the addToArray(someArray) function, by passing in the array which initially had 6 items, it will now have 7 items. When you run console.log(someArray) it will now have 1,2,3,4,5,6,500000. This is because an array is mutable; an array’s variable name references a memory location, rather than in a string or number where a variable name points to the value it holds. When you display the obj values, it will have number as 6, even though you had declared it with the const keyword. We had assigned obj to objCopy, if you display the value of objCopy, it will also have number as 6. //If we display the values of obj1, it will have Jack as name. //now if we try to display the values of obj1, it will have the new field as well. Consider you have multiple threads working on the same object. You cannot predict the outcome of your code since the action of one thread will modify the object, the next thread using this object as a parameter will get totally different data and there’s no guarantee that the operation will be safe. You cannot keep a copy of an object by assigning it to a variable first, then modifying the properties of the original object. The property values in the copy will also change. With immutable types, we know that a value’s state won’t be changed once we create it hence not resulting in unexpected logic in our code. For instance, we want to compare two email strings to authenticate a user. If a string was mutable and a part of our code had altered the email string inside some other method, then the user wouldn’t be able to log in. obj4.name = "Daniels"; //Trying to modify the property value. Note that this won't throw an error, however, it won't change the value of the name property.